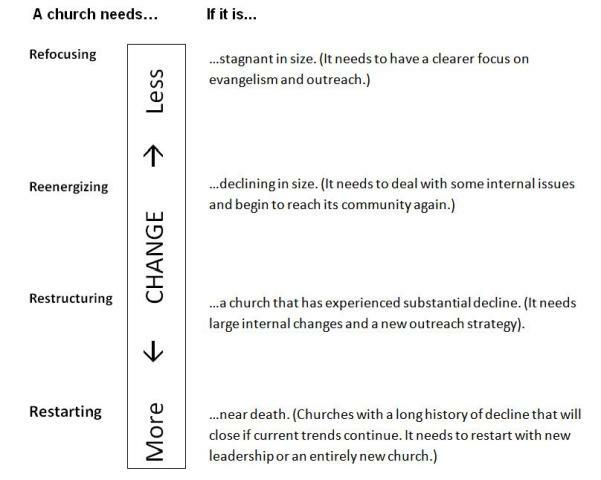 When a church is stagnant or declining in size, diagnosis is that refocusing and re-energizing is needed. How do we refocus & re-energize? Three steps to revitalization: Assessment, Alignment, Advancement. Discover needs of community and potential new ministries. Assess Leadership capability and needs. Research legal documents and history. History and legal documents need to be researched in order to identify potential threats to growth. Recover Faith Factors. In Chapter Three of the book Comeback Churches, Ed Stetzer identifies three faith factors that are essential to church revitalization: 1) A renewed belief in Jesus Christ and the Mission of the Church, 2) A renewed attitude for servanthood, 3) Strategic Prayer Efforts. Discover/Recover the unique, God given Mission, Vision, Values. The revi team should participate in Church Planter Basic Training & take advantage of coaching networks & suggested reading lists to help discover a vision for the community. Make necessary identity changes. Name? Signs? Location? What identity changes may be necessary to birth new vision & energy in the church? Restore needed Church Systems for life and health. See above comment about Church Systems. What systems will need new energy & attention going forward? Vision Renewal Launch Service. Plan for a Vision Renewal Celebration as the church moves into a period of advancement and growth. Plant, water, and bring in the harvest. The church should experience some growth as systems are slowly restored and outreach, assimilation, small groups move people to Christ and spiritual maturity. Multiply disciples, leaders, and ministries. A new generation of leaders will begin to emerge that will carry the Church into the future. Partner in Acts 1:8 Missions. The Church will be capable of taking on missions endeavors beyond its Jerusalem and potentially assist other churches with revitalization/renewal. Download the paper, Steps to Revitalization. Posted on May 8, 2013, in Ministry, Northshore Baptist Associations. Bookmark the permalink. 8 Comments.